Cementless acetabular cups for primary total hip arthroplasty have had excellent results, with failure rates typically less than 5% at up to 10-year follow-up. Tritanium is a 3-dimensional metal interface that has been used for porous biological fixation. The purpose of this study was to review the clinical and radiographic results of the use of Tritanium cups (Stryker Orthopaedics, Mahwah, New Jersey) for primary total hip arthroplasty. Two hundred eighty-eight total hip arthroplasties performed using a porous titanium acetabular cup in 252 patients between 2008 and 2010 were reviewed. One hundred thirty-three men and 119 women with a mean age of 58 years (range, 18–88 years) were included. Mean follow-up was 36 months (range, 24–56 months). Outcomes evaluated were implant survivorship, Harris Hip Score, complications, and radiographic outcomes. At final follow-up, no cup failures had occurred. Mean Harris Hip Score improved from 53 points (range, 33–82 points) preoperatively to 91 points (range, 64–100 points) postoperatively. One complication occurred; a 64-year-old woman with recurrent postoperative effusions underwent hip exploration and required abductor mechanism repair. On radiologic evaluation, no signs existed of progressive radiolucencies or changes in cup position. The survivorship of the Tritanium cup and the low complication rate is comparable with previous studies using other porous-metal prostheses. Longer follow-up study is needed and assessment of the results of using this implant in the revision setting is important. The authors are from the Center for Joint Preservation and Reconstruction (QN, KI, RP, RED, MAM), Rubin Institute for Advanced Orthopedics, Sinai Hospital, Baltimore, Maryland; and the Adult Reconstruction and Total Joint Replacement Service (SFH), Beth Israel Medical Center, New York, New York. Drs Naziri, Issa, and Pivec have no relevant financial relationships to disclose. Dr Harwin receives royalties from Stryker and SLACK, Inc; is on the speakers bureaus of Stryker and Convatec; is a paid consultant for Stryker and Convatec; and has stock or stock options in Stryker. Dr Delanois is on the speakers bureaus of Omni and Stryker; is a paid consultant for Stryker; and is a board member of the Maryland Orthopedic Association. Dr Mont receives royalties from Stryker; is a consultant for Janssen, Sage Products, Inc, Salient Surgical, Stryker, OCSI, and TissueGene; receives institutional support from Stryker; and is on the speakers bureau of Sage Products, Inc.
Funding was received from Stryker Orthopaedics in support of this work. Correspondence should be addressed to: Michael A. Mont, MD, Center for Joint Preservation and Replacement, Rubin Institute for Advanced Orthopedics, Sinai Hospital, 2401 W Belvedere Ave, Baltimore, MD 21215 (mmont@lifebridgehealth.org). Highly porous titanium is a 3-dimensional metal interface that has been used for porous biological fixation. It is similar in structure to porous tantalum acetabular cups.3,5,12–14 The Tritanium acetabular cup (Stryker Orthopaedics, Mahwah, New Jersey) is expected to have similar excellent results when compared with other porous metal components. The 3 senior authors began using these cups in 2008 for all primary THAs. The authors reviewed the clinical and radiographic results of the use of titanium cups for primary THA. In specific, outcomes evaluated included failure rates, Harris Hip Scores, complication rates, and radiographic findings. The authors evaluated 288 THAs performed in 252 patients by 3 experienced adult reconstructive surgeons (S.F.H., R.E.D., M.A.M.) at 2 high-volume institutions using a porous titanium acetabular cup between 2008 and 2010. One hundred thirty-three men and 119 women with a mean age of 58 years (range, 18–88 years) were included. Mean follow-up was 36 months (range, 24–56 months). Indications for THA were primary osteoarthritis (n=250), osteonecrosis (n=27), rheumatoid arthritis (n=7), and femoral neck fracture (n=4). Institutional review board approval was obtained from both institutions. The Tritanium primary acetabular cup has a hemispherical shell with a repeating lattice design, 72% porosity, a coefficient of friction of 1.01, and an average pore size of 546 microns (Figure 1).15 The component is available in a solid back shell (a solid design) and hemispherical cluster hole shell (with clustered screw holes). The solid and the cluster hole designs range in size from 44 to 66 mm. The Tritanium multi-hole shell has multiple screw holes and is available in sizes 48 to 80 mm. The multi-hole shell is produced by a different manufacturing process, but the pore structure and size are similar. In the current study, 218, 57, and 13 hips received solid back shells, hemispherical shells, and cluster hole shells, respectively, and the sizes of the acetabular components used ranged from 48 to 64 mm. Figure 1: Tritanium acetabular cup (Stryker Orthopaedics, Mahwah, New Jersey). Solid back shell design (A). Hemispherical cluster-hole shell design (Stryker Orthopaedics) (B). Hemispherical multi-hole shell design (Stryker Orthopaedics) (C). Clinical evaluation was based on Harris Hip Score results.16 All patients returned for follow-up at approximately 6 weeks, 6 and 12 months, and yearly thereafter. At initial follow-up, patients were examined and assessed for surgical complications, such as prolonged wound drainage, hematoma formation, superficial or deep infection, deep venous thrombosis, dislocation, intractable pain, nerve palsy, and cup failure. Standard anteroposterior and frog-leg lateral radiographs were obtained at each follow-up for all patients and were reviewed by the senior authors. The acetabular zones described by DeLee and Charnley17 were used to assess bone fixation using the Anderson Orthopaedic Research Institute radiographic Criteria.18 Aseptic loosening was defined as 2 mm or more of progressive radiolucencies on serial radiographs. Collected data were entered into an Excel spreadsheet (Microsoft Corp, Redmond, Washington) and were analyzed using GraphPad Prism (GraphPad Software, San Diego, California). Failure was defined as removal or exchange of the acetabular component due to an aseptic cause. At final follow-up, aseptic acetabular component survivorship was 100%, and no titanium cup failure had occurred. Mean Harris Hip Score improved from 53 points (range, 33–82 points) preoperatively to 91 points (range, 64–100 points) postoperatively, a mean improvement of 37 points (range, 20–58 points). One major complication occurred, making the complication rate approximately 0.4%. 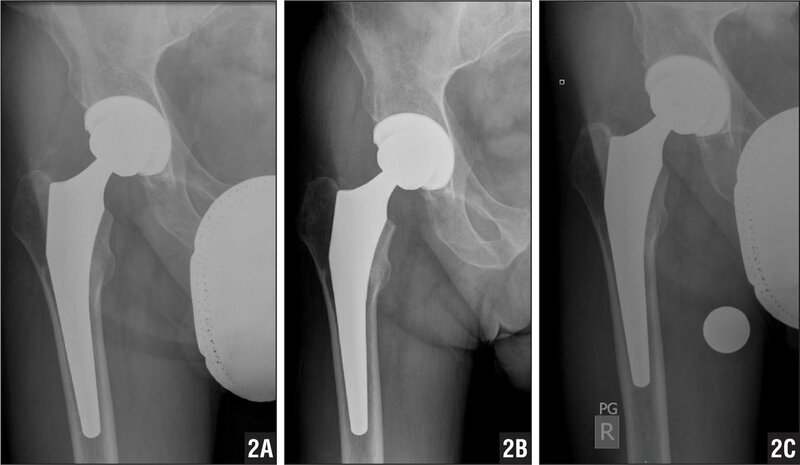 A 64-year-old woman had recurrent postoperative effusions and underwent hip exploration with abductor mechanism repair 3 months postoperatively. At last follow-up 25 months postoperatively, her Harris Hip Score was 90 points. On radiographic analysis, no components showed changes in alignment or inclination angles. Zonal radiographic analysis revealed no signs of progressive radiolucencies or cup migration (Figure 2). Figure 2: Postoperative anteroposterior hip radiograph of a patient who received a Tritanium cup (Stryker Orthopaedics, Mahwah, New Jersey) (A). Anteroposterior hip radiograph at 1-year follow-up (B). Anteroposterior hip radiograph at 3-year follow-up (C). The use of porous metals in cementless THA has had successful results at mid- to long-term follow-up in multiple studies. In the current study, the authors assessed the short-term survivorship of a new highly porous titanium metal acetabular component in primary THA for the treatment of various hip arthritis etiologies. The clinical outcomes (ie, Harris Hip Score and complication rate) were assessed and compared with previously reported data on other highly porous metal prostheses. The current excellent results are comparable with those reported for other highly porous metal acetabular components.1–3,5,19,20 Gruen et al3 reported the outcomes of 414 porous tantalum cups (Trabecular Metal; Zimmer, Inc, Warsaw, Indiana) with a pore size of approximately 550 microns that had a 100% survivor-ship rate at 2-year follow-up. Macheras et al5 reported survivorships of up to 99% at 8- to 10-year follow-up in 151 hips that had received a porous tantalum Trabecular Metal monoblock acetabular component (Zimmer, Inc) with an approximate mean pore size of 550 microns. The Table shows studies using porous metal acetabular cups. The results of the highly porous titanium metal acetabular cup used in the current study differ from the results of some of the previously reported studies on older-generation titanium shells. Cheung et al19 reported the outcomes of 66 THAs using a smooth hydroxyapatite-coated press-fit acetabular cup (Omnifit PSL HA; Osteonics, Allendale, New Jersey) with a pore size of approximately 250 microns. They reported cup survivorships of 95.4% and 83% at 5- and 9-year follow-up, respectively.19 Jafari et al13 evaluated the outcomes of revision THA in 207 patients (214 hips) receiving hydroxyapatite-coated titanium acetabular cups (Stryker Orthopaedics) compared with 79 patients (81 hips) who had received porous tantalum acetabular cups (TM; Zimmer) and mean pore size of 550 microns. The failure rate (both mechanical or radiographic) was 8% at a mean follow-up of approximately 52 months (range, 24–98 months) for the titanium cups and 6% at approximately 35 months (range, 24–63 months) for the tantalum cups, respectively. Because 80% of the failures in the titanium group occurred after 6 months postoperatively, Jafari et al13 reported that the older hydroxyapatite-coated titanium acetabular cups only had the potential for bone ongrowth, unlike the porous tantalum cup that had successful bone ingrowth. Due to a pore size and porosity that is comparable with the porous tantalum cup, the titanium shell used in the current study should allow for similar osseointegration. Several limitations existed in the current study. It was not a prospective study, and no comparison or matching groups were used. All procedures were performed by 3 high-volume, fellowship-trained adult reconstructive surgeons; therefore, the current results may not be easily reproducible by less-experienced or low-volume surgeons. However, the results are valuable because few reports have been published on the outcomes of the Tritanium acetabular cups. More long-term follow-up studies are needed to evaluate the outcomes. The excellent short-term clinical and radiographic survivorship results for the use of a porous titanium acetabular cup are encouraging. The Tritanium acetabular cup may be an improvement over other porous-coated titanium implants, and the authors expect results comparable with those of other successful prostheses. Although further follow-up is recommended, the authors will continue to use this acetabular cup for primary cases and will study its use in the revision setting. Chen CJ, Xenos JS, McAuley JP, Young A, Engh CA Sr, . Second-generation porous-coated cementless total hip arthroplasties have high survival. Clin Orthop Relat Res. 2006; (451):121–127 doi:10.1097/01.blo.0000224047.71377.5e [CrossRef] . Grobler GP, Learmonth ID, Bernstein BP, Dower BJ. Ten-year results of a press-fit, porous-coated acetabular component. J Bone Joint Surg Br. 2005; 87(6):786–789 doi:10.1302/0301-620X.87B6.15335 [CrossRef] . Gruen TA, Poggie RA, Lewallen DG, et al. Radiographic evaluation of a monoblock acetabular component: a multicenter study with 2- to 5-year results. J Arthroplasty. 2005; 20(3):369–378 doi:10.1016/j.arth.2004.12.049 [CrossRef] . Komarasamy B, Vadivelu R, Bruce A, Kershaw C, Davison J. Clinical and radiological outcome following total hip arthroplasty with an uncemented trabecular metal monoblock acetabular cup. Acta Orthop Belg. 2006; 72(3):320–325. Macheras G, Kateros K, Kostakos A, Koutsostathis S, Danomaras D, Papagelopoulos PJ. Eight- to ten-year clinical and radiographic outcome of a porous tantalum monoblock acetabular component. J Arthroplasty. 2009; 24(5):705–709 doi:10.1016/j.arth.2008.06.020 [CrossRef] . Malizos KN, Bargiotas K, Papatheodorou L, Hantes M, Karachalios T. Survivorship of monoblock trabecular metal cups in primary THA: midterm results. Clin Orthop Relat Res. 2008; 466(1):159–166 doi:10.1007/s11999-007-0008-3 [CrossRef] . Moen TC, Ghate R, Salaz N, Ghodasra J, Stul-berg SD. A monoblock porous tantalum acetabular cup has no osteolysis on CT at 10 years. Clin Orthop Relat Res. 2011; 469(2):382–386 doi:10.1007/s11999-010-1500-8 [CrossRef] . Ramappa M, Bajwa A, Kulkarni A, McMurtry I, Port A. Early results of a new highly porous modular acetabular cup in revision arthroplasty. Hip Int. 2009; 19(3):239–244. Blumenfeld TJ. Implant choices, technique, and results in revision acetabular surgery: a review. Hip Int. 2012; 22(3):235–247 doi:10.5301/HIP.2012.9281 [CrossRef] . Kremers HM, Howard JL, Loechler Y, et al. Comparative long-term survivorship of uncemented acetabular components in revision total hip arthroplasty. J Bone Joint Surg Am. 2012; 94(12):e82. Taylor ED, Browne JA. Reconstruction options for acetabular revision. World J Orthop. 2012; 3(7):95–100 doi:10.5312/wjo.v3.i7.95 [CrossRef] . Bobyn JD, Stackpool GJ, Hacking SA, Tanzer M, Krygier JJ. Characteristics of bone ingrowth and interface mechanics of a new porous tantalum biomaterial. J Bone Joint Surg Br. 1999; 81(5):907–914 doi:10.1302/0301-620X.81B5.9283 [CrossRef] . Jafari SM, Bender B, Coyle C, Parvizi J, Sharkey PF, Hozack WJ. 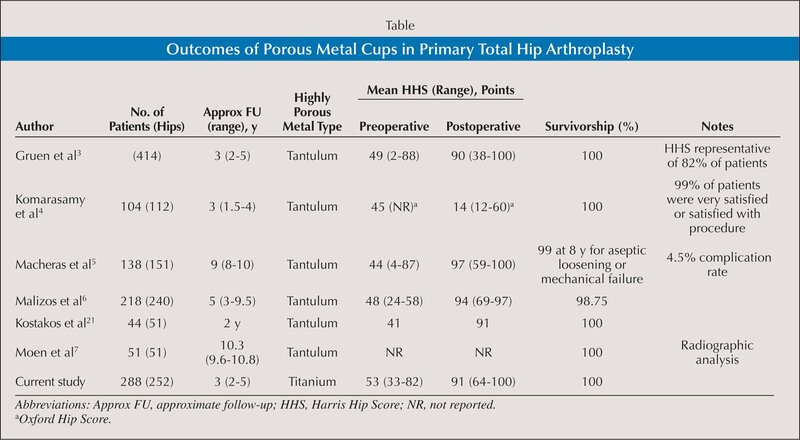 Do tantalum and titanium cups show similar results in revision hip arthroplasty?Clin Orthop Relat Res. 2010; 468(2):459–465 doi:10.1007/s11999-009-1090-5 [CrossRef] . Unger AS, Lewis RJ, Gruen T. Evaluation of a porous tantalum uncemented acetabular cup in revision total hip arthroplasty: clinical and radiological results of 60 hips. J Arthroplasty. 2005; 20(8):1002–1009 doi:10.1016/j.arth.2005.01.023 [CrossRef] . Lohana P, Woodnutt DJ, Boyce DE. Sciatic nerve palsy: a complication of posterior approach using enhanced soft tissue repair for total hip arthroplasty. J Plast Reconstr Aesthet Surg. 2010; 63(4):e400–e401 doi:10.1016/j.bjps.2009.10.014 [CrossRef] . Harris WH. Traumatic arthritis of the hip after dislocation and acetabular fractures: treatment by mold arthroplasty. An end-result study using a new method of result evaluation. J Bone Joint Surg Am. 1969; 51(4):737–755. DeLee JG, Charnley J. Radiological demarcation of cemented sockets in total hip replacement. Clin Orthop Relat Res. 1976; (121):20–32. Moore MS, McAuley JP, Young AM, Engh CA Sr, . Radiographic signs of osseointegration in porous-coated acetabular components. Clin Orthop Relat Res. 2006; (444):176–183 doi:10.1097/01.blo.0000201149.14078.50 [CrossRef] . Cheung KW, Yung SH, Wong KC, Chiu KH. Early failure of smooth hydroxyapatite-coated press-fit acetabular cup--7 years of follow-up. J Arthroplasty. 2005; 20(5):627–631 doi:10.1016/j.arth.2004.10.002 [CrossRef] . Garcia-Rey E, Garcia-Cimbrelo E. Clinical and radiographic results and wear performance in different generations of a cement-less porous-coated acetabular cup. Int Orthop. 2008; 32(2):181–187 doi:10.1007/s00264-006-0305-6 [CrossRef] . Kostakos AT, Macheras GA, Frangakis CE, Stafilas KS, Baltas D, Xenakis TA. Migration of the trabecular metal monoblock acetabular cup system. J Arthroplasty. 2010; 25(1):35–40 doi:10.1016/j.arth.2008.09.027 [CrossRef] .